Lock in a great price for Holiday Inn Express Newcastle Metro Centre – rated 8.9 by recent guests! Very large towels. Bathroom door closes two ways. You can close in just the toilet space or the whole bathroom. Room comfortable, and we could swap our pillows with feather ones! Good pub for delicious eats just next door. Bed was comfy, staff were super friendly and efficient. It is a budget hotel and we needed a one night base for visiting Newcastle. The hotel delivered basic clean accommodation excellent value. Easy to park and lovely staff. Very quiet even though the hotel was quite busy. Comfy bed, excellent breakfast and very helpful and friendly staff. 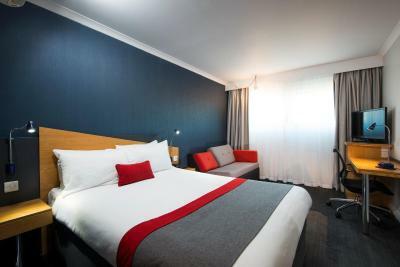 Holiday Inn Express Newcastle Metro Centre This rating is a reflection of how the property compares to the industry standard when it comes to price, facilities and services available. It's based on a self-evaluation by the property. Use this rating to help choose your stay! One of our top picks in Gateshead.Conveniently located off the A1 at the Metro Center, this hotel is 10 minute drive from Newcastle city center. It is walking distance from restaurants, public transport and the intu MetroCentre shopping and entertainment venue. The hotel offers free WiFi. All rooms feature a 32-inch flat-screen TV with Freeview and an en-suite with power shower. Rooms also include irons, ironing boards and hairdryers for convenience. There is a residents’ bar, and a buffet breakfast is served every morning which features a selection of continental and hot items including bacon, sausages, scrambled egg and baked beans. The Holiday Inn Express Newcastle Metro Center has free car and coach parking, and there is a lounge area where guests can enjoy a meeting, coffee, or evening meal. The hotel also has a business center with audio/visual equipment available. The hotel is a short distance from Newcastle Business Park, Newburn Riverside Park, The Watermark and the Team Valley Trading Estate. Sunderland and Durham are a short journey away. The nearest airport is Newcastle International Airport, 5 mi from the property. When would you like to stay at Holiday Inn Express Newcastle Metro Centre? A wheelchair accessible room suitable for up to 2 adults. This spacious room has a double bed, wider doorways, visual fire alarms and adapted bathroom facilities. It also features free WiFi, a 32-inch TV with Freeview and an private bathroom with power shower. A wheelchair accessible room suitable for up to 2 adults. This spacious room has 2 single beds, wider doorways and adapted bathroom facilities. It also features free WiFi, a 32-inch TV with Freeview and an private bathroom with power shower. Our Holiday Inn Express hotel at Newcastle's Metro Centre is comfortable and convenient, an ideal choice when visiting the land of the Geordies! We are one of the first Holiday Inn Express Hotels in the UK to show off the New Generation design bedrooms. With vibrant new colours, fab new beds and sofa beds and some extra touches in all rooms - we are excited to be showing off our new look! House Rules Holiday Inn Express Newcastle Metro Centre takes special requests – add in the next step! Holiday Inn Express Newcastle Metro Centre accepts these cards and reserves the right to temporarily hold an amount prior to arrival. Our check-in time is 3pm and the hotel is unable to guarantee an early check-in unless the room is booked for the previous night. Guests are advised that IHG Rewards Club points are not applicable for reservations made through this website. It wasn't as close to the town centre as I thought but only a 10min drive. More my concern than hotel's in fairness. Located near shopping centre, traffic at midday was busy but was reasonable as you'd expect in any town. Met my needs for a flying visit. Nice comfy bed, no noise and easy to find. Quite nice breakfast, good way to start the day. Good variety, something for everyone. Choice of places to eat around hotel, walking distance. Not much for a family to do here though, I just needed a reasonably good value hotel for the night. Rooms tidy clean well equipped,comfortable beds,plenty of towels family friendly, great for disabled too. Breakfast good plenty of choice especially for kids, great parking, in the middle of everything fab place will definitely go again. Beds were lousy, not good value for money. How after a very long journey, the sofa bed and cot were already made up ready for the kids to go to sleep. Staff were lovely and check in was quick and easy. Great value for money and a reasonable selection at breakfast. Warm, cosy room and had the essentials.